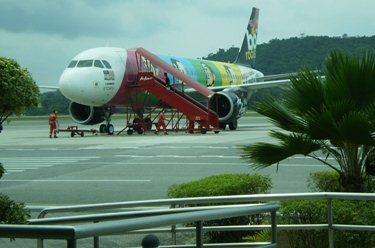 Langkawi International Airport is the only airport of the island. This is where all the International and domestic flights to Langkawi operate. The airport is located at the main island (i.e. Pulau Langkawi) in Padang Matsirat which is about 25 minutes driving distance from the capital town of Kuah. It's a no frill small airport. Prior to 1987 this airport was only a small landing strip. Those days it used to handle only about 20 passengers a day. 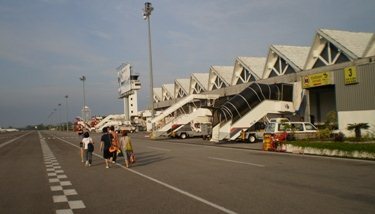 After a major renovation, the first proper airport of Langkawi was made operational on 1st July, 1987. And on 2nd November 1988, the first international flight started its operation in Langkawi. In 1991, more improvements and developments were done. Langkawi Airport started to gain huge significance as it began hosting Langkawi International Maritime and Aerospace Exhibition (LIMA), a mega event which held here biennially. The event showcases the latest aerospace and maritime technology and grand air shows where major players from all over the world participate. The event is a huge crowd puller not only from Malaysia, but also from many Asian countries and all over the world. Due to increasing demand and popularity in tourism, Major renovations were again done in 1995. The Langkawi airport facilities were re-designed and built to handle an annual passenger capacity of 2.5 million and a peak hour capacity of 1000 passengers (at any point of time). Today it is already handling well over 1.5 million passengers per year. The car parking facilities were increased to accommodate up to 500 cars compared to only 100 earlier. 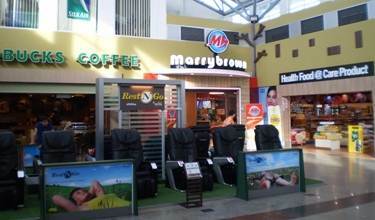 About 25 duty free outlets were opened at the airport including couple of eateries and cafes. The space of the arrival and departure halls were increased by almost 4 times. 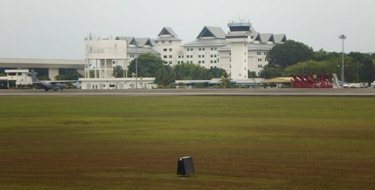 Update September 2018: A major expansion and renovation has been completed for Langkawi International Airport (LGK) following one year of work. The airport can now handle 4 million passengers annually compared to 1.5 million previously. The gross floor area of the terminal building has been increased to 23,000 sq. meters from 15,000 sq. meters, parking area has been increased, no. of boarding gates have been increased to 8 from 5, washrooms renovated etc. At present there are 6 airlines operating from the airport to 4 domestic and 5 international destinations. After the flight lands, you will need to walk along the tarmac for a short distance to reach the arrival hall. There is no covered jet walk or aero-bridge here. So if it rains, you are likely to get wet unless a crew hands over an umbrella to you. And on a hot sunny day, you are likely to sweat by the time you reach the air-conditioned arrival hall. The arrival area is simple. It's a large hall with a baggage claim area and series of stalls offering car rentals and taxi services. However the exit corridor leads to another larger hall area beyond a sliding gate and that larger hall area is common with departure. Here you will get all the duty free shops and cafes. In fact this common area is accessible to anyone (not necessarily just passengers). Don't expect too many jazzy glittering stores and eating places, although there are a few cafes and nice stores here like the Starbucks, Marrybrown, Polo, Kenny Rogers etc. You really don't need to purchase anything at the airport unless you urgently require something, there are ample duty free shopping centers in the island. But if you must, then check out Langkawi Airport Duty Free Shopping. If you are a foreigner and your port of entry is at Langkawi, then you will need to fill up the disembarkation form and hand it over to the Immigration Officer along with your passport on arrival. You may also need a visa depending on your country of origin and duration & type of stay. Visit Visa & Passport for Langkawi/Malaysia to know about the travel documents that you need to be ready with. The best option is to take a taxi for your hotel. There is a pre-paid taxi counter at the arrival hall with published rates for different destinations. This is the easiest and most convenient option. However, if you want to be on your own, then you can also rent a car at the airport. There are a number of car rental companies at the arrival hall. You can even avail of a private limousine service. Visit Langkawi Airport Transfer for details. Al Rahji and Maybank have ATMs in the arrival hall (one near the Polo store and the other near Starbucks). Maybank also has a counter here for currency exchange (as you just come out of the arrival exit corridor to the common area). Maybank operates between 9:15am to 4:30pm Monday - Thursday; 9:15am to 4pm Friday; it's closed on weekends. I had exchanged currencies at both Kuala Lumpur and Langkawi Airport. I found Maybank at Langkawi offering one of the best rates. Lady at the counter although looks sleepy, is super swift in dealing with the notes. Right opposite to the Maybank counter and on the other side of the corridor, you will see another currency exchange counter. There are a bunch of public phones near the arrival hall exit. You can use your credit card, local coins or calling cards (which you can buy from duty free zone) to make calls. Trolleys are available free of charges, and you can carry them right up to the taxi point. There is also a Tourist Information Center at the Langkawi airport arrival area. It's right opposite to Maybank Currency Exchange Counter. You can pick up free maps and brochures, and also get suggestions on the top Attractions and Tours of the island. Check out Hotels in Langkawi to know about the best hotels by category and location. I have often found fairly heavy traffic at the departure terminal, particularly if your flight is leaving in the afternoon or evening. So try to come here at least keeping two hours in hand as long queues are expected at the check in counters. While departing, the check-in counters are in the same large hall area which is common with the arriving passengers where there are duty free shops. Departure area is however in the other end of the hall (left side). There are several duty free stores here selling cosmetic items, perfumes, clothes, souvenir & gifts, accessories and also liquor & tobacco. This is your chance to pick up duty free items from Langkawi in case you missed out in shopping during your stay at the island. In general the prices here are far cheaper than in Kuala Lumkpur International Airport. So if you are going back via KL and plan to do some duty free shopping there, do first take a look at the items at Langkawi airport. I bought three packs of chocolates at Langkawi departure hall (pre-security) and later checked at Kuala Lumpur airport which offered only two packs for the same price. Plaza Premium Lounge: This is a private lounge located in the departure hall but outside the secured area. You can avail the facilities here at a cost. Facilities include food & beverages, bar, wi-fi, shower facility, phone, news papers/magazines, charging station etc. Food served includes both local favorites as well as international dishes such as nasi lemak, hainan chicken rice, ipoh hor fun soup, pan-seared salmon with caper butter sauce, crab agio-olio fettuccini etc. 2-hours lounge usage costs US$42. 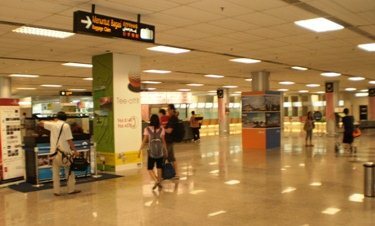 Once you complete the security check in, you will get into the secured departure lounge which is meant exclusively for the departing passengers. There are rows of chairs facing the runway and you will see many flights taking off or landing. In the domestic departure hall, there is a small cafe at the back side selling snack items like Tuna puffs, chicken sandwiches, packaged snack items like wafers etc and also tea, coffee and cold drinks. Prices are very reasonable. You will also get ice creams here. This is a good place to take your breakfast in case you are taking a morning flight. We always do so. There are few small round tables with chairs laid out in front of it and surrounded by show-flowers that give you a nice little cozy ambience to take your coffee and snacks. Thanks for maintaining this website with such good and precise description of Langkawi Airport, my first time in Langkawi, read your website and found things exactly where you described it to be, down to the curry puffs! Nice work! I am from India. I am visiting only Langkawi. Which currency should I carry? INR, USD or MYR? If it is easy and convenient I will prefer carrying INR and exchange it after arrival. Also, where can I do it near the airport? Please let me know. I must say that your website is really informative and useful. Thanking you in anticipation. Ideally you should carry MYR. 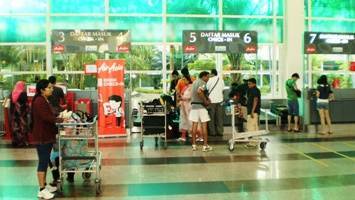 Other currencies can be exchanged at the airport on arrival at Langkawi. There is a money exchange counter near the arrival hall door at Langkawi airport. However exchange rates offered here are usually quite unfavorable to passengers. Check the rates before you go for exchange.